In the very beginning stages of my blog, I wrote about hypnosis for weight loss. Hypnosis is something I am a huge believer in, I find it to be extremely successful in re-wiring our subconscious to make for better habit changes and behaviors that would otherwise be difficult to change. I have been using hypnosis on an occasional basis for 4 years or so. I don’t do it religiously, but I use it when I feel like I need a boost. There are hypnosis recordings out there that can help with almost any issue. Most recordings help you better yourself and take your great self even higher. It’s also a great way to relax. Hypnosis and guided meditation recordings are very similar in that they both take you to an extremely relaxed and meditative state of mind: your mind becomes calm and relaxed and also very open to receiving any hypnotic suggestions. This is where the magic happens, the hypnotherapist (in a recording) taps into your subconscious to give you subtle suggestions that your mind will accept and therefore, eventually, change your behavior. Because this is done on such a deep and profound level, these changes are more likely to stick. The only caveat is that you have to believe it works! The whole idea behind hypnosis is that the more you believe it can work, the more easily you will be able to get into the hypnotic state, and the more effective the suggestions will be. I suggest you give it a try, whether it’s a recording about intuitive eating (like the ones I’ll discuss here) or one for something else, just to relax. About a month ago, I gave up on dieting and began my journey into intuitive eating. I started searching the web for people with a similar mindset. That’s how I came across Jennifer Polle. Jennifer Polle is a Certified Clinical Hypnotherapist and EFT (Emotional Freedom Techniques) Practitioner and has worked in the field since 2001. “Clearing Emotional Blocks” (29 min) – Designed to gently assist the subconscious in releasing beliefs, emotions and past experiences that may be keeping you from being as happy and healthy as you can be. Special emphasis on building self-acceptance and self-worth. Voice over soothing background music. “Intuitive Eating for Weight Release” (28 min) – Especially effective after using Clearing Emotional Blocks for a month, this CD will assist you in getting re-acquainted with your natural, intuitive sense of what your body needs and wants for food and exercise. It’s based on the basic principles of intuitive eating and does not advocate “dieting”, but rather encourages you to trust the part of you that knows exactly what you need. Voice over nature sounds and soothing background music. 1. I listened to the first one a couple of days in the first week and then a few more in the next week. I really enjoyed the first recording because it deals exclusively with self-affirming and positive thoughts. It aims to dissolve any self-doubt we may have about ourselves, reaffirming us that we ARE enough and we ARE good. Without fixing the emotional issues and blocks we have, it will be very difficult to begin intuitive eating as a lifelong journey. As Intuitive Eating book’s authors say, we MUST fix a relationship with ourselves and food in order to be happy. We must let go of self-doubt and begin a life filled with self-love instead. 2. The second recording I recommend listening much later than the first. Jennifer recommended listening to it at least after the second week, but after hearing it once, I felt I was simply not ready to listen to weight loss messages yet. Although the hypnosis is not only about weight loss, it is more of a combination of intuitive eating AND weight release due to proper eating, I just felt that the obsessive weight loss and diet thoughts and misconceptions were too fresh in my mind. I recommend listening to the second recording once YOU think you are truly ready to hear it. A good idea would be about a month or more (as she mentions in the CD info) after starting an intuitive eating approach of your own. But it might be sooner or later for you. We’re all different! Jennifer has a lovely soothing voice which relaxes the mind. The music is nicely chosen for the recording as well. I liked the duration too, it is perfect for nighttime listening as it is not very short but not super long, I find it to be the perfect length for slow drifting off into sleep while reinforcing some positive suggestions in the mind. I’ve been talking about hypnosis on and on, but you think “Okay, Kammie, but how am I supposed to know it really works?” Well how about entering this giveaway? 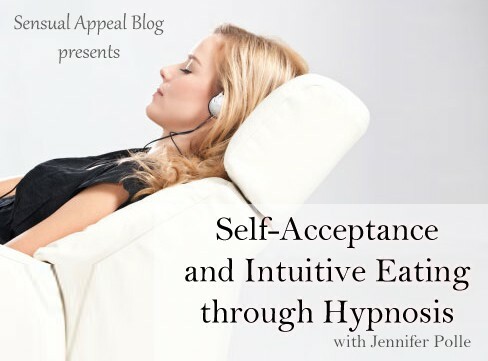 If you believe and would like to try one of Jennifer’s hypnosis recordings for yourself, then this giveaway is perfect for you! And because I know you are all different, Jennifer has agreed to give YOU, the winner, the choice of which recording you would like to receive! If you aren’t interested in the two I reviewed, you are welcome to try out another one from her list. You can see a full list of her recordings here. You get an option of getting a CD or MP3 of the recording. Disclaimer: I have received the two recordings from Jennifer Polle free of charge and I was under no obligation to write a review or host a giveaway. I was the one who contacted Jennifer about her services, not the other way around. I was not otherwise compensated. I haven’t ever tried hypnosis before, but I think all of the information about rewiring passageways in the brain is totally interesting! I wanted to use it for my injured knee, but never got the chance. Cool to see you talk so highly of it! I tried one for weight loss, i think it helped , i need ro try it again though. I’ve never tried hypnosis before, but I do meditate often! I have never tried hypnosis before, but I am definitely intrigued. I occasionally try to meditate and I find this helps me center myself. As for dieting, I am trying to do a mix of intuitive eating while still trying to keep my calories counts on the lower side. I’ve never tried hypnosis, but I’m very intrigued. I’ve never done hypnosis. I’d be interested to experience it!! I have never tried it but I have been so curious and totally believe in it! I have never tried hypnosis, but remember seeing many shows in school and am amazed at its effectiveness. I’d love to try this! I think hypnosis is so interesting, though I think it’s something that’d be a huge challenge for me. I struggle to let my mind go to those sorts of places — like in yoga when things get all New Age-y, I tend to be all, “Alll right, and this is where I step off this train” haha — but I see she has one about letting go of anxiety and goodness knows I’m willing to try just about anything to help myself learn how to deal with anxiety. I’d definitely love to give that a shot! I’ve always been interested in hypnosis & intuitive eating. I would love to learn more! That’s awesome! I really like that one too and I think it’s lovely you and your husband listen to it together, it can be a type of a couple activity too.. together and “me” time, all in one! Great idea! I have never tried hypnosis, but I have always wanted to try it! I think it sounds very interesting, I would like to know more about it. While I’ve never tried hypnosis myself two friends on mine did. One of them was able to get better about her acrophobia that way which impressed me. I’d be curious to find out if it’d work for me, too.